Ambassador Daniel Ionita with three of the embassy’s honorees: Diana-Cristina Iancu (left), Horia Cernusca and Cristina Moldovan. The Romanian Embassy in Oslo has arguably had more than its share of dealing with a less-than flattering image of its citizens in Norway. 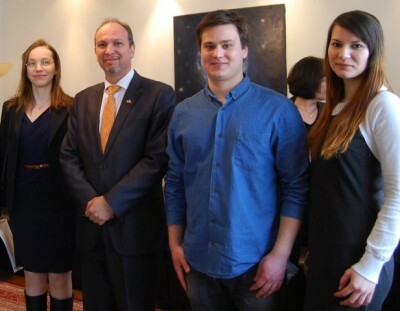 Ambassador Daniel Ionita decided it was time to instead turn the spotlight on some highly educated and successful resident countrymen, and opened up the embassy on Monday with a ceremony and art exhibit to do so. It’s not always easy being the ambassador from a country that often grabs headlines for all the wrong reasons. Ionita arrived in Oslo in October 2011, just in time to see hundreds of people with Romanian passports land on the front pages of newspapers for their illegal camping around the city, their occupation of a church and their forced moves to new but temporary havens. The debate continues in cities all over the country over how to help poverty-stricken Europeans who’ve been arriving in Norway, or how to chase them away. Over the weekend, one of the political parties forming Norway’s government, the Center Party, actually approved an effort to close Norway’s borders, a move aimed especially at keeping out “organized criminal elements” tied to eastern Europe. Ionita and Vasile Ungureanu, deputy head of mission at the Romanian Embassy, were candid about their desire to shift the spotlight over to many other Romanians who often are overlooked. 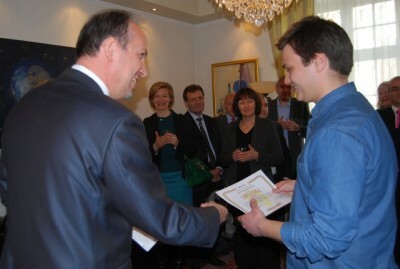 Ionita thus awarded diplomas on Monday to five young Romanians whom he called “extremely talented” and who make a valuable contribution to Norwegian society, instead of threatening it. “We want to promote their image in the kingdom of Norway,” said Ionita.